We invite you to stay informed on the latest news of TranTien Foundation’s work. As an online journal, blog is updated frequently from the field to bring you the most touching and inspiring stories; the most recent entries are posted at the top, and the most dated at the bottom. Blog collects the live stories of patients, surgical team, volunteers working on the mission trip. There was a great opportunity for the two parties to work together: a 42-year old Vietnamese teacher, who had a mastectomy 4 year ago (after an early diagnosis of stage 1 breast cancer), was found fit for a breast reconstruction. Such reconstruction was possible thanks to TTF Project Hue. Hue College of Medicine and Pharmacy and TTF were able to use that case as a success story and send to the community the message that breast cancer is curable and that patients can resume normal life if they had early diagnosis and appropriate treatment. Hue College of Medicine and Pharmacy and TTF realize that they still have a long way to go in promoting that message. Health prevention is not a priority for Vietnamese women. They are often unfamiliar with breast self examination and mammogram. When exposed to these preventive practices, they do not comply with screening recommendations. Poor and rural Vietnamese women especially distrust Western medicine. They may appear polite and compliant and will not question authority, but when faced with possible symptoms, they may first seek the assistance of non-Western healers such as shaman. They also see any surgery as a disruption to the harmonious balance between yin and yang and thus would only submit to an operation as a solution of last resort. However, in this battle against breast cancer among Vietnamese women, TTF is confident that the partnership with Hue College of Medicine and Pharmacy, and the initial success with the old teacher case will add strength and credibility to the message of early detection and appropriate treatment. 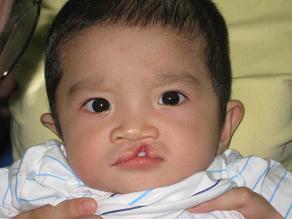 Every year there are more than three thousand (3000) Vietnamese children born with cleft lip. Parents of these children experience rejection, and humiliation from the community. Their whole families feel the pain, sadness, and sometime shame. It is particularly hard for girls who usually have beautiful names; but cleft lip girls are often being called names or simply “con sut” i.e. girl with split lips. Because beautiful daughters would bring joy to the family, every day parents pray and hope to meet a surgical team to repair the cleft lip. When they heard of the TranTien Foundation team coming into town, they registered their daughters with the anticipation that their daughters would have new smiles and the families a new life full of joy. HA LEN is an 11- year-old girl of a poor family, one of the poorest in the nation. Her parents work as day laborers. They live in a shabby tin-roofed house, erected on an earthy floor. The area lacks basic hygiene. It is very hot in summer and in the flooding or raining seasons HA LEN family often has to seek shelter elsewhere. repaired so that she could appear normal. 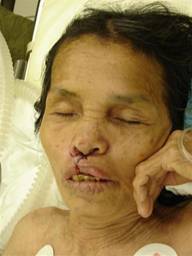 To fulfill her wish, on the last April 2009 trip, Dr Sum Tran reviewed HA LEN’ s medical records, consulted with and obtained clearance from Trantien Foundation Medical team to perform the surgery on HA LEN’ s lip. The operation was a tense moment for surgeons, anesthesiologists, parents and family members alike. The surgical team cautiously applied local anesthesia with intravenous sedation assisted by a balanced general anesthesia. The operation was a success and HA LEN is doing fine; no complication was noted. She and her family are very happy and expressed the deepest appreciation for a safe procedure; they did not believe this could be done given her severe medical problem. They consider this event a miracle. 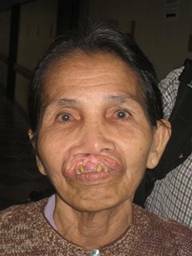 Mrs Phan is a 72 year-old Vietnamese grandmother who had a severe cleft lip since birth. She lives in a very remote area of the mountain, twenty miles away from Hue, close to the Ho Chi Minh trail. She was living in shame and isolation, and almost lost her hope for ever seeing her wish come true: to have a picture of her face with a full upper lip for her offspring to set on the altar. It is an old Vietnamese tradition that children set, on an altar, the best photos of loved ones who have passed away to pay daily respect to them. A Boy Scout troupe got to know her in one of its camping trips took her to town on a bicycle as a passenger in the back seat. She was introduced her to Project Hue of the TranTien Foundation. The surgery was a routine operation for the team but for the grandmother it was a life changing event. After the surgery she cried each time she looked at herself in the mirror. 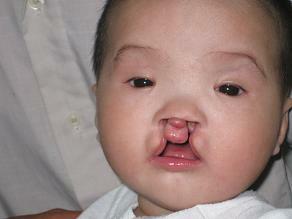 She could be one of the oldest patients ever to have a congenital cleft lip repaired. Mr Dao, a 32 year old man worked as a machinist and had an accident that claimed four fingers of his right hand; only the fifth finger was left. He had no insurance, nor income. After his work related accident, his wife took a job as a helper because they have two children to feed. His wish was to have surgery on his hand that would allow him to hold objects so he could return to work. The Project Hue Surgical Team performed microsurgery to transfer his second toe to reconstruct a thumb. The patient recovered well and after 4 months he returned to work and is now able to earn money to feed his family. Bao Loan is a 16 year old beautiful girl with a third degree burn of about 20% total body surface involving the left half of her body including the shoulder, breast, back and perineum. Two years ago, on a routine trip to take lunch boxes to her father and brother working in the rice field, she fell off her old bike on a small country side road into a big stack of hay. The hay was burning inside with no flame or smoke to alert anyone of the danger. When Loan fell, she stirred up the hay in her struggle to get up and out. As a result of the increased air circulation, the fire took off and became a blaze. Trapped by the weight of the bike, she could not free herself. It was a miracle that Loan survived this incident. This accident left her with very bad scarring and disabilities. After two-years of treatment at a local hospital, her family ran out of insurance coverage for her and was in debt; the situation was desperate. When she was introduced to Tue Tinh Duong Hai Duc, a Buddhist Charity Organization, she had a devastating contracture and adhesion of her upper arm to her axilla. Her wish was to regain free movement of her arm so that she could find a part-time job and help her family out of poverty. 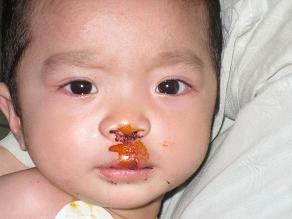 She was admitted to Hue Central Hospital and had surgery by a Project Hue plastic surgeon. She is now back in school with her twin sister Bao Linh. 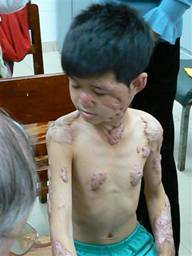 Manh is a 9 year-old boy who suffered a 40% total body burn from a fire secondary to domestic violence (his parents set the house on fire in a suicide attempt). He lost both of his parents. It happened when he was 5 years old. He survived the tragic incident and was treated successful at the local Hospital of Northern Viet Nam. However, he was left with multiple scarring involving his face, upper and lower extremities. 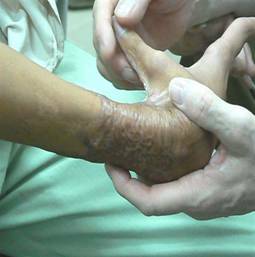 The most serious complication was a severe contraction of his right thumb resulting in his inability to hold a pencil or a cup of rice normally. With the support of the community he is living with his poor grandparents in his native village near Hanoi. He is very polite, mature and intelligent. He is the top of his class at school. Every day, rain or shine, he walks with some difficulty two miles to class and never misses a single day of school. 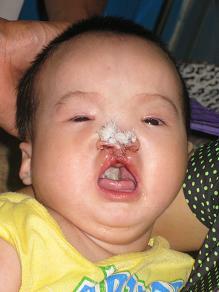 Through a local private charitable group of Hanoi and Hue, Manh was operated on with the Project Hue Surgical Team at Hue Central Hospital. After this surgery, normal movement of his hand was restored. Manh is now a happy boy whose dream it is to attend Hue Medical School and take care of burn victims like him when he grows up. Jennifer Nguyen grew up in the United States. She had her first look into the vastly different life, health care system and operating room work in a third world country when, before entering medical school, she joined the Foundation mission in March 2008. As one of the volunteers, she assisted the surgical team by evaluating patients, donning scrubs, taking photographs and transporting/comforting patients. Jennifer is currently a first year student at the University of Illinois, Chicago School of Medicine. "I will never forget the myriad of mosquitoes, the alluring smell of street-side food, the constant buzzing of motorbikes, the anxious face of someone in need of reconstructive surgery and his or her grateful smile afterwards. When I was presented with the opportunity to travel to Vietnam to shadow world-class American plastic surgeons, I was nervous yet extremely excited. In the end, my voyage has become the most culturally and medically rewarding experience of my life to date. I was privileged to have a glimpse into both the social and scientific avenues of healing in a foreign nation. I observed surgical screening for over 200 desperate and financially needy, yet extremely thankful candidates. I shadowed Mount Sinai surgeons performing as many surgeries as they can fit into a 14-hour -day for five days. I saw the drastic differences between operating room qualities in two different hospitals in Hue. One was clean, air conditioned and modern. The other had concrete floors, tile walls and was frequented by power outages. But regardless of the venue, it was clear that doctors in both are caring physicians who welcome international aid and knowledge to better help the people of their nation. Furthermore, this trip allowed me a view into the lives of American surgeons and all the wonderful personality that comes along. Beyond the medical aspect of the mission, I was also able to experience the cultural aspect of Vietnam: a royal dinner, the shopping, a tranquil boat ride in Ha Long Bay, a visit to the tomb of Emperor Minh Mang and the art of crossing streets without a pedestrian walkway. I would do it all again in a heartbeat. Now that I am enrolled in medical school, my appreciation for this trip has become more solidified as there is always a face of a person that I saw being helped in Vietnam attached to the knowledge I am learning. It is an immensely beneficial immersion learning experience that no summary can suffice."